HyperDocs - Teach It With Tech! It's an innovative way to put an entire interactive digital lesson into your students' hands. 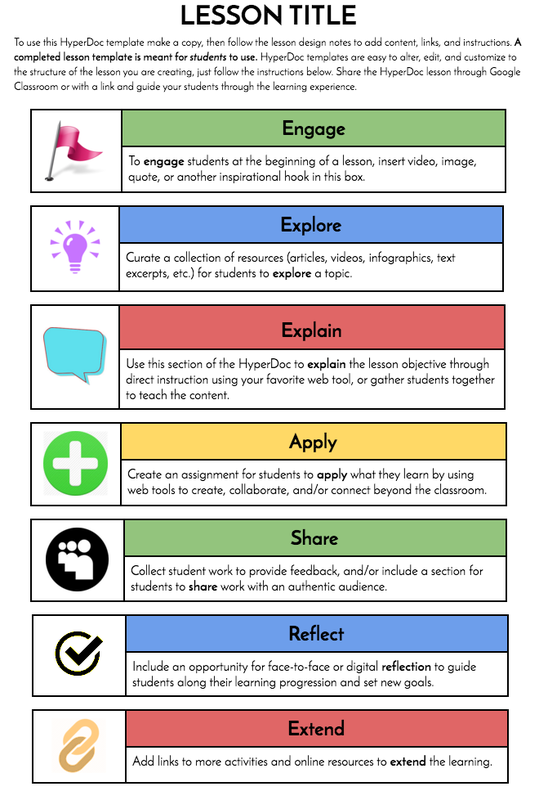 If you're looking for something to replace boring worksheets with something more exciting that allows students to collaborate, think critically, combine information from multiple sources, and create through technology, then HyperDocs is right up your alley. HyperDocs allow you to create and package a lesson plan tailored to fit the needs of your students. Plus, it is inherently engaging! Each lesson includes all the elements you would typically include in a successful lesson: engage, explore, explain, apply, share, and extend. While students are busy collaborating and reflecting on their learning, you are free to connect with students! ​ The term HyperDocs was coined by Lisa Highfill, Kelly Hilton, and Sarah Landis. 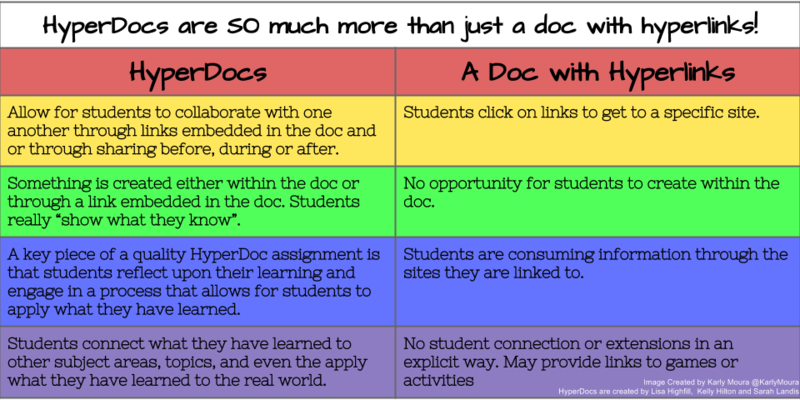 When I first heard about HyperDocs, I thought it was simply a Google Doc with hyperlinks on it. Don't be fooled! It is SO much more complex and meaningful than that. Read about what Lisa, Kelly, and Sarah have to say about HyperDocs on their website here. Engage: Hook your students, get them engaged, and activate prior knowledge. You might use a fun video, interactive website, or audio recording. Explore: Link resources, such as videos or articles, for students to explore more information. Explain: Clarify the learning objective for your students. This is where you could teach a whole group lesson with direct instruction, or add additional resources for students to explore. Apply: What do you want students to create to demonstrate their learning? Give instructions for the assignment. Share: Provide a way for students to share their work and receive feedback. Reflect: Pause for reflection (whole class, think-pair-share, etc.) or link them to a digital way to share their thoughts. Extend: This portion is great for early finishers. Provide extra activities, additional online resources, or challenge them with an extension assignment to extend their thinking. Of course, not every lesson follows the same format. For a variety of templates to meet your needs, head over to this Padlet where educators are sharing templates for all types of lessons. In addition to the Basic six step HyperDoc lesson plan outlined above, there are also templates for close reading, historical biographies, and for workshop lessons. 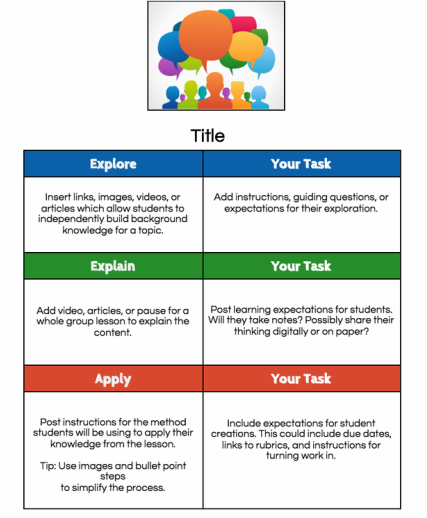 There is also a more basic template that only involves three steps: Explore, Explain, and Apply. That shortened HyperDoc templates is great for beginners that are feeling overwhelmed with creating their first HyperDoc. If you're unsure of what types of resources to include for each section of the lesson, take a look at this helpful Google Doc template created by Sarah Landis. It's packed full of ideas for each step of the lesson. Popular apps and websites used with HyperDocs include YouTube, Google Forms, Kahoot, Storybird, Padlet, Wordle, and of course Google Docs. ​ The best way to understand HyperDocs is to see an example. Luckily, educators have been creating and sharing HyperDocs for all grade levels and subjects. A typical lesson that follows a template will look similar to the images below. Of course, not all Hyperdocs follow a template, and you are free to customize your lesson to suit your needs. To use a template for your classroom, simply open it in Google Docs, click "File" and "Make a Copy" to save it into your Google Drive. Then you can open your own copy, make any changes, and then share it with your students via Google Classroom! Try out some HyperDocs for yourself to see what all the hype is about! Click here to explore a Padlet where educators are sharing their awesome HyperDocs. ​Click here to find even more HyperDoc lessons through an amazing website called TeachersGiveTeachers. ​Once you start creating your own HyperDocs, don't forget to revisit the Padlet or TeachersGiveTeachers to share your lesson with others!